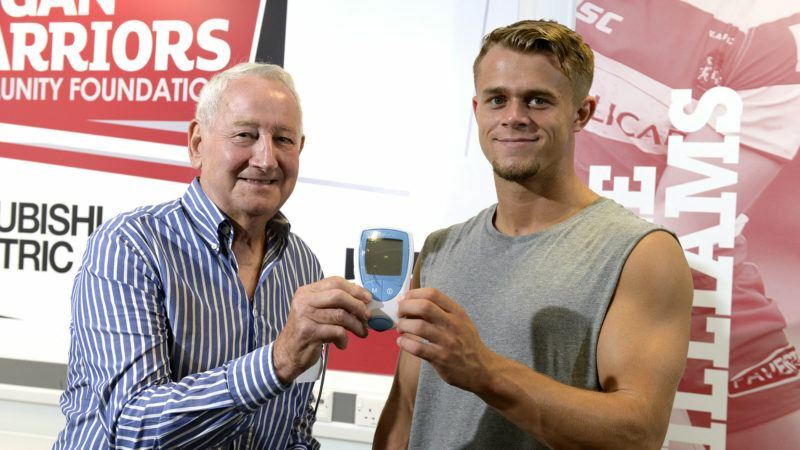 He is best known for his heroics on the field with the Wigan Warriors, but this week full back and winger Lewis Tierney turned his attention to a new NHS service for warfarin users in the town. The Warriors hosted a patient awareness day for the warfarin self-testing technology at its Central Park headquarters in Montrose Avenue. The service is available to 4,000 people in the Wigan area who take the blood-thinning drug. Patients are given a Roche self-testing device and test their blood from home. Readings are sent back to a nurse via a simple automated telephone call or email. Lewis Tierney attended the event to meet with patients. Wigan Warriors are the heart of the Wigan community and do whatever they can to promote the health and well-being of their town. The Warriors use all sorts of clever technology to monitor their fitness. Tierney encouraged warfarin users to find out more about the new service available to those in Wigan. At the event, expert patient John Binks also spoke to attendees. He explained that self-testing is as easy as making a cup of tea. The 84 year old former BAE Systems manager has been using the new service since November. It is convenient for him because he can self-test from home instead of going to the clinic every fortnight. His time in therapeutic range has also improved since starting the service. It’s a win-win situation for John. Around 40 warfarin users attended the patient awareness day. They included Danny Taberner, a 22-year-old university graduate from Westleigh. He is using warfarin after having a massive pulmonary embolism while recovering from testicular cancer. The brave young man is keen to begin self testing so he can pursue his career ambitions as a civil engineer. Danny Taberner has just graduated from Bolton University with a 2.1 degree in civil engineering. Self-testing will give him the freedom to work here, there and everywhere without having to go to the clinic every few weeks. During the event, patients watched demonstrations by nurses, listened to a presentation by expert patient John Binks and asked questions about the free and optional service. There was also a raffle to win five signed Warriors shirts. Inhealthcare is pleased to be delivering the service with Wigan Borough Federated Healthcare. Whilst it is great that INR self-testing is available to patients in Wigan, Durham, Darlington, Ilkley, Isle of Wight and Hull, our broader vision is that this service is made available to all patients across the UK.